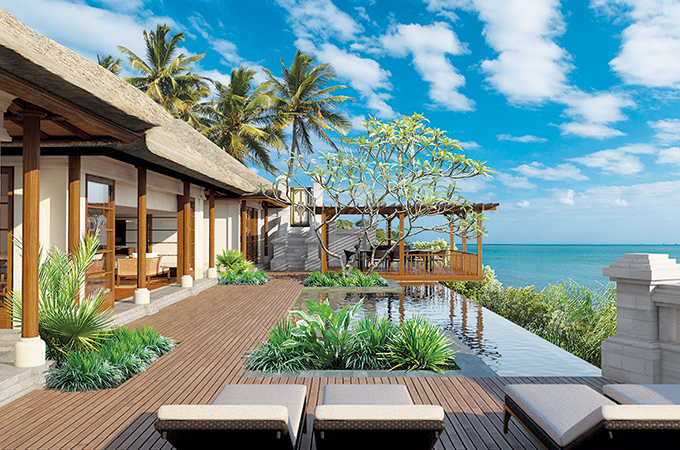 Four Seasons Resort Bali at Jimbaran Bay features a revamped collection of 147 spacious villas including the Imperial and Royal Villas and Epic Dining Experiences, among other services. The resort’s most palatial villas have been entirely rebuilt from the ground up inspired by individual designs by the late renowned Indonesian designer, Jaya Ibrahim. With a contemporary take on the timeless beauty of Balinese design and décor, the villas evoke a strong sense of place and traditional elegance for which Four Seasons Jimbaran Bay is renowned. Embracing the tropical gardens and sparkling ocean views from every vantage point, the villas offer relaxed, beachfront oases for families and friends travelling together as well as for intimate weddings and events, just steps from the graceful curve of Jimbaran’s three-mile beach. The three-bedroom Imperial Villa is a coveted sanctuary with a residential-style 1,300 sq m layout – more than double the original villa’s footprint. Located just metres from the waves lapping on the seashore, the villas gazes over the endless horizon in one direction, and in the other the traditional fishing village of Jimbaran Bay on Bali’s sunset coast. The two-storey design ensures guests can always see the sea no matter where they are or what they are doing. On the upper entry level, the living room’s walls consist of soaring floor-to-ceiling glass doors, which slide open to maximise the indoor-outdoor living and panoramic views. A charming thatch-roof shaded veranda leads to a geometrically-beautiful rooftop garden and lawn surrounded by an infinity-edged water feature – an exclusive venue for intimate wedding ceremonies, celebrations and dining under the stars. Bedrooms have their own private indoor living areas, sundecks and ensuites – making the Villa perfect for families looking for privacy and quiet; the master boasts ultra-luxe his and hers bathroom. The descent from the rooftop garden brings guests to the lower level with dining areas both inside and out, fully-equipped open kitchen, contoured infinity pool facing the ocean, multi-purpose room and gym, and a third bedroom that opens onto the pool terrace. The two-bedroom Royal Villa offers contemporary tropical living with a distinctive design inviting travellers to soak up the coastal views and beach lifestyle of Jimbaran Bay. In addition to the two spacious bedrooms, the Villa features a separate children’s room fitted with trundle beds, while a connecting Deluxe Villa enables guests to expand their hideaway into a three-bedroom retreat with two pools. Combined with a host of new activities – from artist workshops at Ganesha Cultural Centre, sunset cruise and water biking around Jimbaran Bay, culinary innovations, new ocean-front yoga classes and deeply healing spa treatments – the Royal and Imperial Villas offer fusion of worldly sophistication and authentic Balinese style.